Imagine my delight on discovering a beautiful, accomplished soprano from the mid-20th century who was new to me! 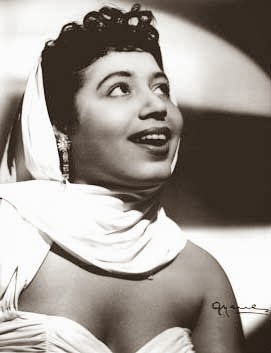 Mattiwilda Dobbs, although not the first African-American singer to perform at the Metropolitan Opera, was the first with a long-term contract there. Among her roles there were Zerbinetta, Zerlina, Olympia, Lucia(! ), and Oscar. The list of other houses where she performed is quite impressive as well. Born in 1925 in Atlanta, she now lives in retirement in Atlanta, having performed all over the world and taught at several universities. Alas, Miss Dobbs is not well represented in recordings, but there are a few to be found. "How beautiful are the feet of them" from Messiah, Händel Society London, cond. Walter Goehr, undated.